Juliette El-Mir Saadeh, the wife of Syrian Social Nationalist Party founder Antoun Saadeh, set a trend for the political and social norms for gender politics in the Levant. The red five-pointed star on the yellow flag of the Kurdish People’s Protection Units (YPG) evokes the symbolism of the Cold War and the socialist gender egalitarianism of the political left. The world’s attention frequently focuses on the U.S. supported Syrian Democratic Forces (SDF) coalition headed by the YPG and the movement’s future in eastern Syria. The highly publicized images of the Kurdish female fighters in the YPJ (the SDF coalition’s female units) have made them a strong source of praise in the West. In the October 2017 YPJ Commander Rojda Felat was widely covered in the press for leading the SDF campaign against Da’esh in Raqqa. Another example was the outcry over the brutal death of the YPJ fighter Amina Omar during Turkey’s military operation in Afrin (who went by the nom de guerre Barin Kobani) in February 2018. However, with the Assad regime emerging as the prominent political force in Syria’s conflict, Damascus appears to be attempting to reach a political accommodation while simultaneously embarking on a confrontation with the YPG/SDF. The attack by pro-Assad forces on the SDF base near Deir Ezzor in February 2018 contradicts the regime’s willingness to facilitate YPG fighters through its territory to the front in Afrin and lend militia fighters. This leads to the possibility that the recent fighting with Turkish forces in Afrin and the Syrian regimes’ converging interest with the YPG could bring the Kurds “home” to President Assad. 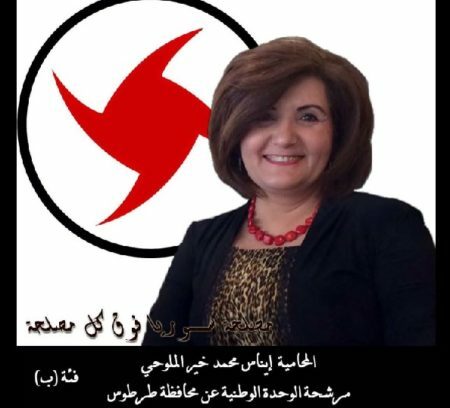 One of the pro-Assad factions (with its own militia), the Syrian Social Nationalist Party (SSNP), is an interesting case study as it is well-positioned to flex its nationalist credentials as a way for the regime coalition to confront and curtail the YPG/SDF’s efforts to foster a regional autonomy. As the YPG/SDF continues to come into contact with the Assad regime forces along the Euphrates River and elsewhere, the role of women in Syrian politics and in the conflict will become even more pronounced in the coming political shakeup and period of reconstruction, especially given that both camps tend to view themselves as the modern and progressive bulwark best suited for confronting the extreme gender-regressive nature of the country’s Jihadist movements. Given the war’s cruelty and the dangerous conditions often faced by women in Syria, along with rapidly shifting socioeconomic conditions, it will be essential to monitor and analyze the role of women in both within the Assad camp, the YPG/SDF, as well as in the wider opposition groups, and the non-aligned members of Syrian society as a whole. What does this have to do with Juliette El-Mir Saadeh? There has been little discussion or efforts to explore gender-oriented politics in the Syria regime territories and its place amongst the factions of the pro-Assad forces. To gain insight into the history of this phenomenon and the roots of the Levant’s secular-progressive brand of authoritarianism and political attitudes towards women, the story of Juliette, the Arab World’s first female political prisoner, could be one place for analysts to begin. Much of Juliette’s life would be encompassed by the political activities of her husband, Antoun Saadeh and his establishment of the SSNP in 1932. After having fled Lebanon in 1938 due to political persecution from the colonial France authorities, Antoun Saadeh, in a self-imposed exile, arrived in South America with the intention of establishing a network with the Syrian and Lebanese communities living overseas to financially bolster his nascent movement. In 1939 that he met Juliette El-Mir, the daughter of Lebanese immigrants who had moved to Argentina in the late 1800’s. Juliette had been working as a nurse who was training to become a doctor. She began corresponding with Saadeh, with whom her family was impressed, and they married in 1943 (Other sources put the date April 1940 or 1941). After the end of WWII, Saadeh returned to Beirut in 1947 with much fanfare. Juliette joined him in Beirut by the end of 1947 with her two daughters, Sofia and Elissar. The couples’ youngest child, Raghida, was born in Lebanon. 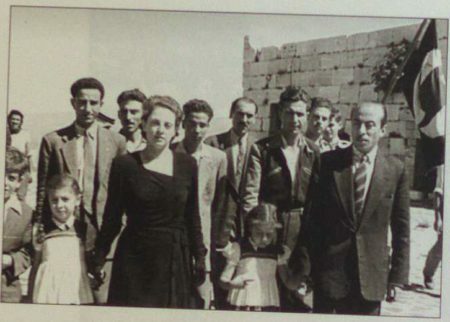 Men and women celebrating the return of Antoun Saadeh in Beirut in 1947. 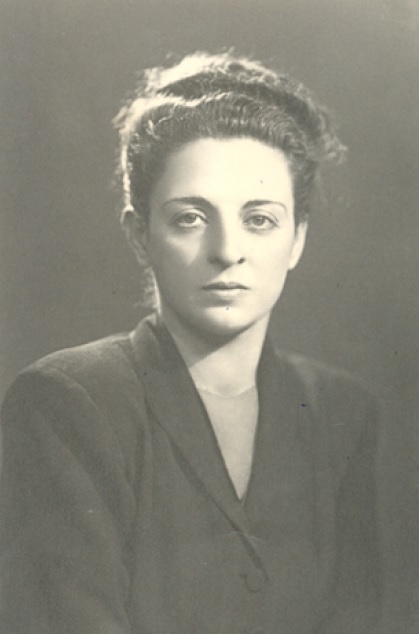 While in hiding during Saadeh’s July 1949 uprising and flight, Juliette witnessed arguments amongst the partisans who came by her house on the rapidly unfolding situation. A noted emphasis fell on Saadeh’s political advisor, Maaruf Saab, over misleading the others on the planned meeting with Husni Zaim. General Zaim had taken power in March 1949 in Syria’s first military coup. On the surface, it appeared he sought to use Saadeh as a way to establish a friendly SSNP regime in Beirut (he did once insist that Lebanon should be part of Syria) but his true intentions would soon prove otherwise. On July 6, while hiding in a hotel in Damascus, she learned that her husband would proceed to meet with Zaim and decried the fact that the Syrian dictator had already repeatedly let Saadeh down with broken promises of political support and arms and was not to be trusted. The Saadeh family had a particularly close relationship with the infamous military figure Adib Shishakli, who would later take control of Syria via his own coup. Juliette wrote in her memoirs that she sought the opinion of Shishakli when moving in hiding during the Zaim debacle, including whether or not she should seek refuge at the Greek Orthodox Our Lady of Saidnaya Monastery. However, Zaim’s security forces eventually located Saadeh’s family in Latakia and Juliette was moved to the Saidnaya Monastery. On July 10th that she discovered that Saadeh had been betrayed by Zaim, turned over to the Lebanese army, and subsequently the recipient of a hasty execution on July 8th. The Patriarch tried to orchestrate the family’s return to Argentina but she refused on the grounds that the Lebanese government must first allow her to collect their personal belongings in Lebanon, a request which was refused. Saadeh left property he owned in Dhour el Choueir to his wife along with four hundred Syrian pounds. After his death, she was also promoted to the SSNP’s Supreme Council and received the title al-Amina al-ula (First Keeper or Trustee). In regards to George Abd Messih’s leadership and his ultimate legacy, many SSNP members remain divided. Some admired his versatility and toughness, but others detested his overbearing personality. However, he is generally credited for holding the party together after Saadeh’s execution. It was only a month later that Zaim himself was overthrown by Syrian army officers connected to the SSNP. Confronting the deposed general in the presidential palace, a plotter accused Zaim of “betraying Saadeh.” After Za’im was executed at Mezzeh prison on August 14, Shishakli brought Zaim’s bloody shirt in front of Juliette and shouted, “We have avenged him!” One party elder remarked that this scene was a big shock to Juliette, being from Latin America. Shishakli would go on to launch his own political party, the Arab Liberation Movement (ALM), which was modeled after the SSNP. Abd Messih’s legacy and Juliette’s fate are closely associated with the 1955 assassination of Adnan al-Malki and the Baath’s purge of the party in Syria, which saw member of SSNP imprisoned or flee to Lebanon. However, Juliette was one such member who sat through the show trials and was sentenced to life imprisonment in the Qala’a Dimashq (Citadel of Damascus – now a UNESCO World Heritage Site), which had served as a prison during the French Mandate before it was finally closed in 1986. After Hafez al-Assad’s faction of the Baath Party (the so-called Military Committee) carried out coup and overthrew the anti-UAR secessionist government on March 8, 1963, Juliette was pardoned and released due to ill health on December 26, 1963. The Syrian government stipulated her release on the condition she would not live in any Arab country so she went into exile in Paris, France. 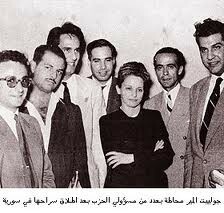 Juliette remained active in the party as a member of the Supreme Council until her death in 1976 in Beirut. One Syrian historian reflected on his thoughts on her memoirs, “Juliette El-Mir’s memoirs are among the finest I have read. They are peppered with detail, emotional, informative, and entertaining, all at once. They are also very honest, which is not often true for memoirs. Regardless who physically wrote them, she obviously dictated the narrative.” While Juliette is still highly venerated by all factions of the SSNP, it is evident by the views of some factions who call into question the validity of her memoirs and her troubled relationship with Abd Messih show how one woman’s place in history continues to haunt the party today. Her legacy as the first woman political prisoner in the Arab World exemplifies the long history of political persecution and fraught nature of women in the region. The Levant in particular has been the scene of female participation in the region’s conflicts. Of course, the Israeli-Palestinian conflict and Cold War left a heavy mark on gender roles and combat in the Levant, especially among the governments and non-state actors aligned with the Soviet Union. For instance, Syria under Hafez al-Assad and the local branch of the Baath Party ideologically conditioned women through a military-style education system. One other example was Rifaat al-Assad, the brother of Hafez, whose own loyal military units saw female troops roamed through Damascus in the 1970s, forcing the veils and hijabs off the heads of women on the streets as an unsanctioned part of Rifaat’s attitude towards modernization. In the West, the SSNP is typically viewed as a far-right party. While regarded as militaristic and violent, the SSNP, like the Baath formed later on, had an avant-garde character that influenced many other secular-nationalist movements in the Levant. It influenced the Arab Liberation Movement (ALM) during the Shishakli period. The ALM had a socially inclusive approach towards women but was later disbanded after Shishakli’s fall from power. 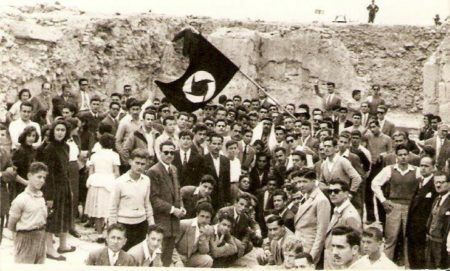 Furthermore, unlike communism, which never really took off in the Arab World, the SSNP was thought to be an indigenous party. In the Syrian Civil War, the scope of women fighting against the so-called Islamic State (Da’esh) has been well documented. The YPG-SDF gained widespread praise for leading the fight against Da’esh. However, they have been unable to shake the allegations they are tied to the Kurdistan Workers Party (PKK), which also has a dominant female presence. Outside of the region, the ideology of the PKK has also been compared to Peru’s Shining Path or Colombian FARC, both which used women fighters. At one point during Nepal’s Civil War (1996-2006), the Maoist insurgency’s ranks were thought to be half female fighters. In the Sri Lankan conflict (1983-2009), the Tamil Tigers (LTTE) gained notoriety for their widespread use of female suicide bombers, with missions based not on the promise of an after-life, but for duty or service to the community or the nation. Dr. Robert Pape noted in his book, Cutting the Fuse: The Explosion of Global Suicide Terrorism and How to Stop It, the LTTE foster this concept through “Thatkodai” which means giving oneself. This also evokes another, similar Tamil word “Thatkollai” for killing oneself. Of course this secular concept of sacrifice for the nation is also found within both the SSNP and YPG. How does the SSNP typically view the Kurds and the YPG-SDF? Kurdish separatism is viewed as an anathema to the SSNP’s ideology since it runs counter to the party’s goal of creating Greater Syria. The party hence regularly denounces any attempt of Kurdish regionalism, autonomy, or independence as a conspiratorial Jewish project. 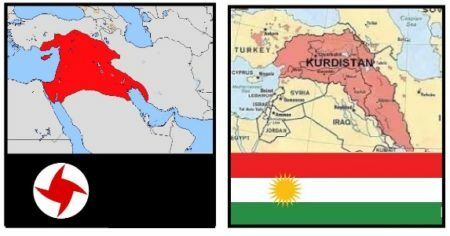 An edited screenshot of an image posted in a Twitter feud between Kurdish supporters and an SSNP sympathizer showing both sides share irredentist dreams of lost land unredeemed due to European colonialism. Is there any historical ideological connection or inspiration between the YPG’s official political body, the Democratic Union Party (the PYD) and Kurdish nationalism with the early SSNP and Baath Party from the 1930s-1950s? The PYD is a more recent party, founded only in September 2003, but it is especially interesting to note the shared progressive ideology or gender equality that would be considered part of the political left. Up until 1955, the SSNP itself maintained a united front, but began to split after the Adnan al-Malki assassination. Toward the end of the 1960s both the SSNP and Lebanese Communist Party (LCP) introduced major changes to their strategic policies which coincided on many fronts. The SSNP did not change its irredentist ideology but began to emphasis the leftist and socialist features in it, which made it easier for the party to reconcile with all leftist groups, including the Communists. Inaam Raad, a leading party theoretician and leader and assumed the SSNP’s presidency and fostered a strong anti-Zionist position. In addition, Raad had leftist tendencies and aligned the SSNP closely with the Soviet Union and the socialist-oriented Lebanese National Movement which contained the Progressive Socialist Party (PSP), the LCP, and the PLO under Arafat during the Lebanese Civil War. Another brief point worth mentioning is the strong emphasis by both parties on the cult of leadership personality, with each sharing a deep and enduring veneration for leaders who paid in full for the cause: the SSNP’s Antoun Saadeh (execution) and the PYD’s Abdullah Ocalan (life imprisonment). Rana Khalaf, a research fellow at the Centre for Syrian Studies at the University of St. Andrews spoke at length on the history and the ideology of the PYD: “One important area you would need to consider is the era difference. The PYD, under the leadership of the Abdullah Ocalan-inspired Kurdistan Communities Union (KCK) shares the ideology of the PKK, which is much older. However, the discourse of the PKK did evolve over time. One major difference (between the PYD, the SSNP and Baath) is that the PYD follows an anarchist ideology (my emphasis added) that sees the notion of the state itself as problematic, thus advocating the notion of democratic confederalism. However, the theory is different in practice in this and other aspects. Take for instance the PYD’s discourse on gender equality. It is noted by many of the activists I have interviewed that the progressive co-presidency rule they follow – which implies a man and a women govern together is also mainly used to keep power with the PYD; this co-presidency is also often shared between a cadre (PYD trusted member who has the power) and a non-cadre . One example cited by activists is a shared presidency between an Arab tribal man (who is the non-cadre with no real power) and a Kurdish women (who is the cadre that takes orders from the PYD) in a local council where the young woman is not herself empowered by this position, rather she is used to serve as the mouthpiece of the PYD. 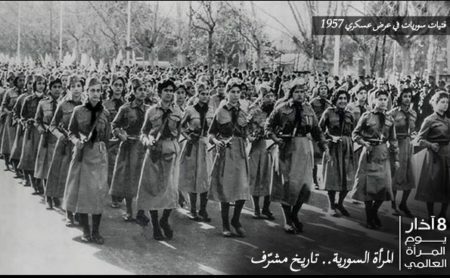 In regards to the history of women fighting with the SSNP, perhaps the most infamous case was Sana’a Mehaidli (“Bride of the South”), who left a deep impression on a generation of Lebanese youth. See The Girl in the Red Beret written in 2009 by Lina Mounzer. 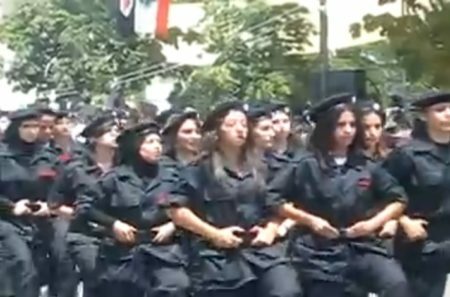 However, there were many other examples of female SSNP militants taking part in either suicide missions or participating as regular militia fighters. Interestingly, the party’s Eagles of the Whirlwind militia in the Syrian conflict does not appear to be fielding women fighters in combat roles, nor carrying out suicide attacks against the YPG, Syrian rebel factions, Da’esh, Hayat Tahrir al-Sham (HTS), or the any of the other jihadists groups. This could be due to the limited size of Assad’s forces or the fact they are operating in the capacity as a government-sponsored support force, instead of insurgency targeting Israeli Defense Forces (such as in Lebanon in the 1980s). However, it is curious why the Syrian regime forces have not featured women fighters prominently in their propaganda videos depicting front line combat scenes in the conflict’s major battles. Despite how much praise and attention the YPJ has won, the Assad typically regulates women to the roles off the battlefields – reporters, humanitarian aid, spokespersons, entertainment, moral boosters, etc. Though the regime is eager to illustrate it is the only version of Syria that is capable of maintaining an open, liberal environment for women, it still retains a rather traditional approach to women in its combat forces, whereas the YPG-SDF have won hearts and minds by putting women on near-equal status in the fight against Da’esh. Essentially, the regime sees itself as a paternal protector to keep women safe from the country’s jihadist elements. Regime military women, when in uniform and armed, are primarily stationed in primarily defensive or support roles. (Above) Women in uniforms with the SSNP Eagles of the Whirlwind insignia on the right arm, with the party’s storm logo on the left arm. A military source, Roland Bartetzko, said they appeared to be wearing a British “desert kit” style uniform but the camo pattern are not an exact match, but rather likely a “fantasy” copy ordered online. The trousers are a U.S. style in cut and the design of the pockets. 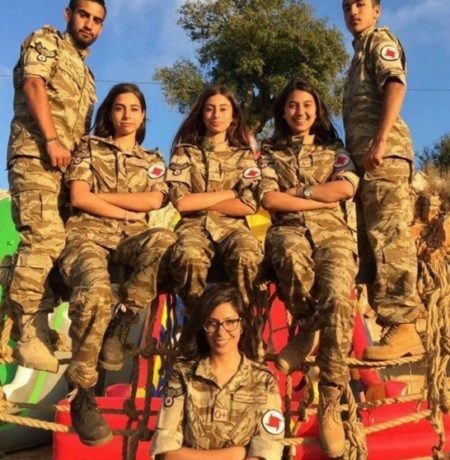 Especially interesting to note is there are no other SSNP fighters seen in online images/video wearing this type of uniform, therefore, this image appears to be for promotional use. In addition, there are no pictures or video footage of female SSNP militants actively fighting in the Syrian Civil War. One SSNP youth in Damascus explained, “Syria is different than Lebanon unfortunately, in Lebanon the SSNP is more Orthodox, women members would fight alongside men (in the Lebanese Civil War), would commit suicide bombings…etc…in Syria, thanks to Baath Party’s incomplete (read inefficient) secularism, Syrians are unfamiliar with females fighting.” On the other hand, the women of the YPG have been far more active, even fighting to the death. One incident during Turkey’s Afrin offensive was erroneously described by the New York Times as a suicide bombing. A Kurdish activist relayed this was likely more a “last stand” type moment against the Turks, rather than a suicide operation planned in advanced. 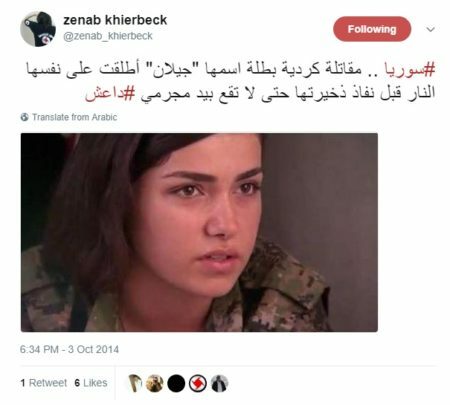 One female SSNP member, Zenab Khierbeck, hailed the YPJ woman who committed suicide in 2014 on the battle field rather than risk capture by Da’esh. She tweeted: #Syria… A Kurdish fighter heroine named Jilan shot herself so she would not fall into the hands of the #Da’esh criminals. 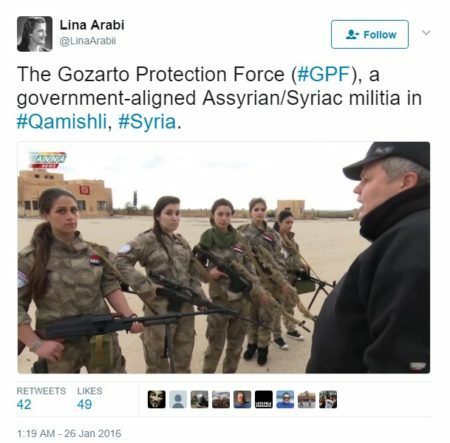 Female members of the Gozarto Protection Force are one other example of a pro-regime militia fielding women. 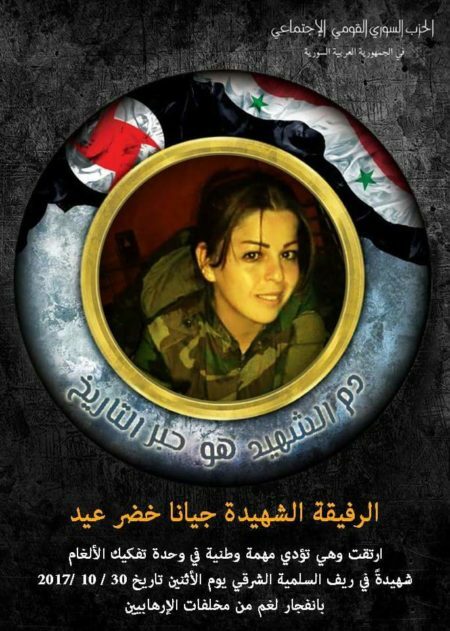 A female SSNP member named Jianna Khadher Eid was killed while enrolled in the National Defense Forces in October 2017. Note the SSNP party’s storm logo on the memorial. Russia does not have the right to write a constitution for Syria. The government is not paying enough salaries. The Syrian parliament is full of people who don’t do their job. A young SSNP member in Damascus said “the Syrian people are used to ‘silent MPs,’ so this is a huge change in what people are used to and they like it.” He also added MP Mallouhi is not with the Markaz faction but with the Joseph Sweid and Issam al-Mahayri branch because “the suggestion to teach Syriac sounds likes their faction, as they are more anti-Arabist than the Markaz faction.” Syriac is still used by some Syrian Christian sects for liturgy. In Ali Haidar’s Intifada faction, there are two women in the supreme council (the highest legislative body of the party) and three women on the executive board (the highest executive body of the party). 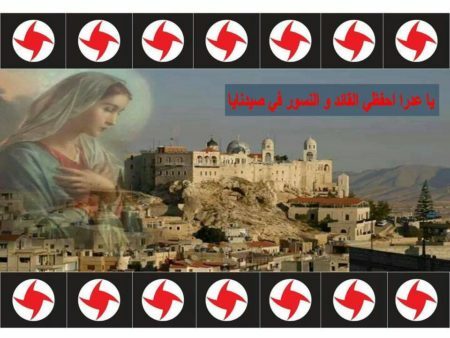 Although staunchly secular, individual SSNP members will occasionally post Christian-themed images on its social media accounts. This is one example which pays homage to Mary and calling on her to protect the party’s militia. Of course, this is the work of partisans acting as an individuals and not officially sanctioned party material. Arwa Abu Ezzeddine, in an October 2015 interview with the pro-Assad Janoubia (South) news outlet, said she joined the party in 1986 and has been active in the central leadership since 2004. She said, “Women have played an active role since the founding of the party. Since entering the cage with the eagles there is no distinction between men and women. Antoun Saadeh played the role as a human example in society, so women can radiate within the party,” she said. There have been a number of women who played a prominent role since the early years of the party’s founding, most notably Afifa Haddad and other influential members in Beirut, such as Fayza Maalouf Antiba and Amina Najla Matouk. 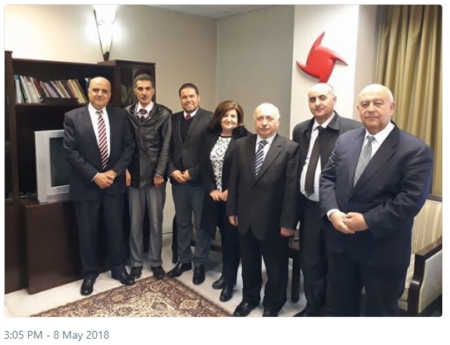 In the case of SSNP comrade Afifa Haddad, the sister of Fouad Haddad (one of the SSNP’s original founding members), she played a role when the party was still underground. The Haddads owned a restaurant opposite the American University in Beirut, which was a meeting place for the teachers and students affiliated with the party. Afifa acted as a look out during the meetings. When Saadeh was first arrested by the French in November 1935, Afifa brought him food (the food was from Haddad’s restaurant). Consequently, she was able to relay messages from Saadeh to his SSNP comrades on the outside. Afifa is considered the first woman in the party. Female political participation, however, remains precarious in Lebanon. 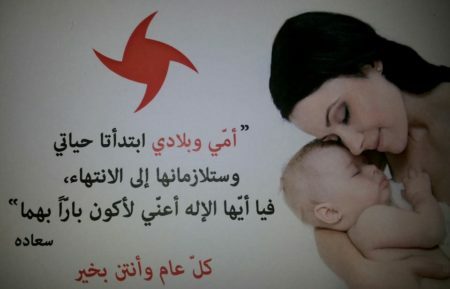 The SSNP, along with others, including Hezbollah, the PSP, LCP, Kataeb Party, and the Future Movement, were the subject of a report in 2014 by the Lebanese Women Democratic Gathering (RDFL). According to Al-Akhbar English, “The study shows that one or two women are represented in each party’s leadership body. 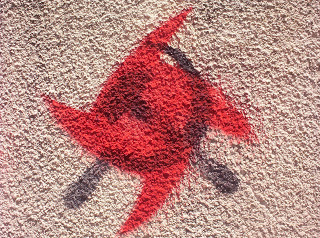 None of the parties that were studied adopted a quota for women in their internal organization, 33 percent absolutely rejected a women’s quota, 50 percent appointed women in some leadership positions and 16.6 percent nominated women for parliamentary elections.” One case was the SSNP member and Lebanese reporter Ghadi Francis, who a few years ago called for an “SSNP Spring” within the party. She noted the movement’s inability to reform and lamented the stagnant nature of the party. Francis was then attacked allegedly by Asaad Hardan’s bodyguard. 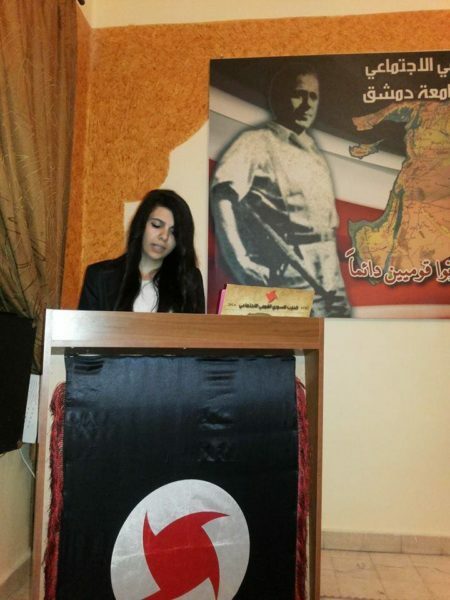 An unidentified SSNP woman speaks at a party event in Syria. One should note that the focus solely on armed women for what lays ahead for Syria is not an accurate indicator for female empowerment. The history of Juliette’s political status and veneration offers only a fleeting glimpse of an early social and political ideology that has, like many other 20th century egalitarian movements of its time, has fallen short of its intended goals. Also, women empowerment means structural changes to the laws, processes, representation – i.e. the unequal power structures. The example of one woman leader, as often throughout history, is an exception not the norm. Outside of the conflict, Syrian women struggle for inclusion at the highest levels of international diplomacy as well. According to one source, the regime strongly fought against the inclusion of Syrian women in the advisory board for the United Nations special envoy for the Syria Staffan de Mistura’s office. It denied them (like the opposition) a seat at the negotiation table. The conservative members of the opposition, in their Islamist discourse, saw women’s voice as Awra (a source of shame); as for the regime, it claimed they were with the opposition. The women then tried to add prestigious women from the regime’s side to the board (one from a government ministry and a TV presenter). Now the regime prohibits these women from leaving Syria. Meanwhile, in Syria, the regime forces and the YPG will continue to square off as they both seek to ward off the Turks and the remaining Syrian rebels. The lasting legacy of women fighting amongst the YPG is still undetermined. As seen with Eastern Ghouta, Idlib Province is likely to eventually fall to the regime, the YPG-SDF and the pro-regime forces could become the last two standing. Though the U.S. Administration has recently indicated it may soon pull out from Syria, this is unlikely since the wider geopolitical nature of the conflict still remains unresolved. A renewed effort by the U.S. to accommodate Turkey with the removal of Kurdish militia from the town of Manbij may also open new possibilities between the YPG and the regime. Simultaneous threats and negotiations will further this trend. The red star looks likely to stay over eastern Syria. Some on the regime side talking about a guerilla war to recover the territory occupied by the YPG and Americans (the SSNP could be one regime faction well-positioned for this task) and the war could yet drag on for years. Still, the striking similarities between the SSNP and the YPG both demonstrate a rarity in the Middle East: they are two organizations with an intense dedication to ideological purity in an era of, as one Syria analyst put it, “ideological bankruptcy.” They both retain their own unique irredentist visions and own brands of romantic nationalism and have created a niche for women in their political hierarchies and fighting forces. As Syria’s women are still subject to extreme violence and vulnerability, the role of women within the future of these two political movements will merit further study. The United States and its allies and partners in the region and beyond must develop a coherent strategy of their own with which to confront Iranian strategy. It is simply unacceptable for the United States and its allies to allow Iran even such progress as it has made in the region. Developing a coherent influence strategy for the Middle East become imperative for US national security. This is why the Levant is such a basket case. The Anglo empire has been social engineering the middle east for decades now. One intervention begets another intervention. And so on and so. It never ends. The drivers are the the Israelis, the Gulf States, the Israeli lobby and the Gulf lobby. They own the US government after all. Why should actual, authentic, Americans care? Much of their financial resources have been and are being poured down the drain in Iraq, Afghanistan, Syria, Israel, Saudi Arabia etc. Domestically, the winners are the US arms manufacturers and the government contractors. The losers are the American taxpayer and the soldiers stationed there. Crony capitalism at its best. The Israelis and the Saudis will fight till the last American standing in defense of their fiefdoms. So let the Saudis take Yemen with their own might. Let Israel deal with Iran. If the US shall not take a side, these actors would ultimately have to negotiate their issues rather than fight. US involvement only prolongs the conflict. So let them fight their own battles with their own people and their on Shekel. The US has more problems as a result of subsidizing and acting on behalf of these cowardly nations than it would if it remained neutral. US need to acknowledge: Either it accepts Russia as a partner in the practice of international politics, or it deals with it as a rival, which must be confronted on the international scene. Russia with its current regime is not a “strategic partner” & cannot be one. It is an enemy. Regardless of whether western leaders recognize it or not, Putin is already waging a hybrid war on the collective West, & its values & institutions to achieve his own strategic ends. Putin poisons the media with toxic propaganda, corrupts politicians & organizations, hacks computer systems, etc. The lack of this recognition makes the collective West weak and vulnerable in the face of this aggression, and makes it prone to appeasing the aggressor.